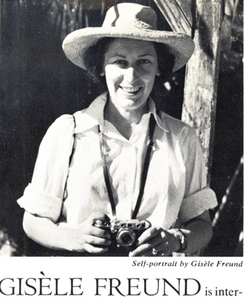 Dr. Gisèle Freund was born in 1908 to a wealthy Jewish family in Berlin. 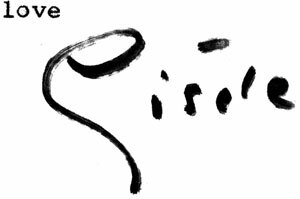 Her father, an avid art collector, encouraged his daughter’s artistic eye by giving her a Voigtlander 6x9 camera when she turned sixteen; it was his gift of a Leica – a small, reliable camera that could take 36 consecutive shots – however, that would allow Gisèle the liberty to develop her unique style. Freund attended university in Berlin and studied under Theodor W. Adorno, Karl Mannheim and Norbert Elias--better known as the Frankfurt School. Her studies were cut short, however, by the rise of Adolf Hitler. Freund joined the anti-Nazi movement and used her light, durable Leica to capture the turmoil of anti-Fascist demonstrations, especially those organized by her friends Bertolt Brecht and Walter Benjamin. When Hitler solidified power in 1933, Freund was forced to flee Berlin with her photographic negatives strapped around body so they would not be confiscated by the police or border guards. 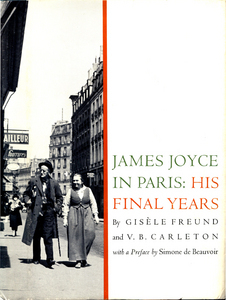 Freund joined Walter Benjamin in Paris and enrolled in the Sorbonne. Her dissertation, La photographie en France au dix-neuvieme siècle [French Photography in the 19th Century], was one of the first books to examine photography as an agent for cultural change and control. Ironically, Freund’s arguments would be proven all-too-true under the craven Nazi propaganda machine. Freund met many of the world’s best thinkers, writers, and artists through her connections at the Sorbonne, but it would be an impromptu photo-shoot in 1933 that would start her world-renowned career. André Malraux’s La Condition Humaine had just won France’s most prestigious literary prize and the author needed publicity photographs.